"Kev Wilkinson is something of a local legend, having pursued his BRB project in various guises on and off for the past quarter century. Starting out as Big Road Breaker and also being the brains behind the Muza Muza label (that released the first Jazzfinger output all those years ago, plus Ashtray Navigations and many more), his identities have gradually evolved over time though his predilections have remained the subsonic, the garagantuan (sonically) and the indefinably disturbing." -Tusk Festival. "One half of Edinburgh’s absurdist sputter and clink duo Usurper and head honcho of Giant Tank – Ali will be performing solo on the night. Having dabbled and drooled his way through improvised collaborations with the likes of Blood Stereo, Phil Minton and Adam Bohman – his combination of avant sound poetry, scuttled performance art and garbled Scots vernacular will provide a fine lubricant." - Braw Gigs. "... the enigmatic Spoils & Relics; lay out their wares for all to see. These include all manner of hard to identify sounds that could have been made inside a deep sea divers helmet at 20,000 fathoms. Here we have shortwave trawls picking up single, impossible to translate words, slight squeaks, wheezes and heaves, sounds of budgie cages being shaken in empty houses, lo-fi electronic squawk, bottles being kicked around a stone floor, parps culled from small boxes with switches on them, electro-acoustic dub, dried peas rattling around a Quality Street tin, a mass beetle exodus ... or none of the above." - Harbinger Sound. 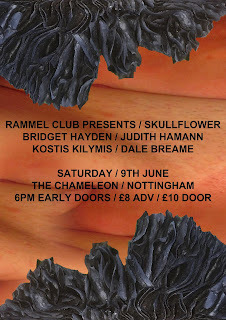 ►Tuesday 20th June at Chameleon, Nottingham. Golden Bee is a new city lounge & cocktail bar located on Old Street of Shoreditch, London with a newly refurbished upstairs bar, terrace & spacious rooftop bar & area. 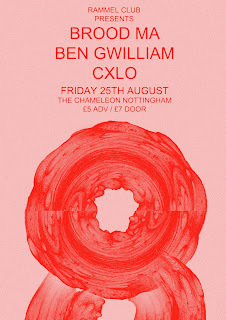 RAMMEL CLUB# 84 - BROOD MA, BEN GWILLIAM, CXLO, Friday 25th August @ Chameleon, Nottingham. 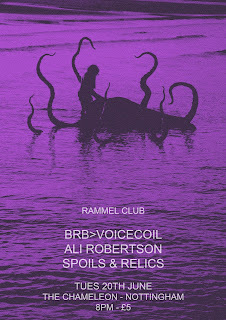 RAMMEL CLUB #91 - Skullflower, Judith Hamann, Bridget Hayden, Kostis Kilymis, Dale Breame. Sat 9th June. #99 - Melting Hand, Bloody Head, Guest Machine @ SOAN 4th May. Nights of visionary global music in Nottingham, UK. 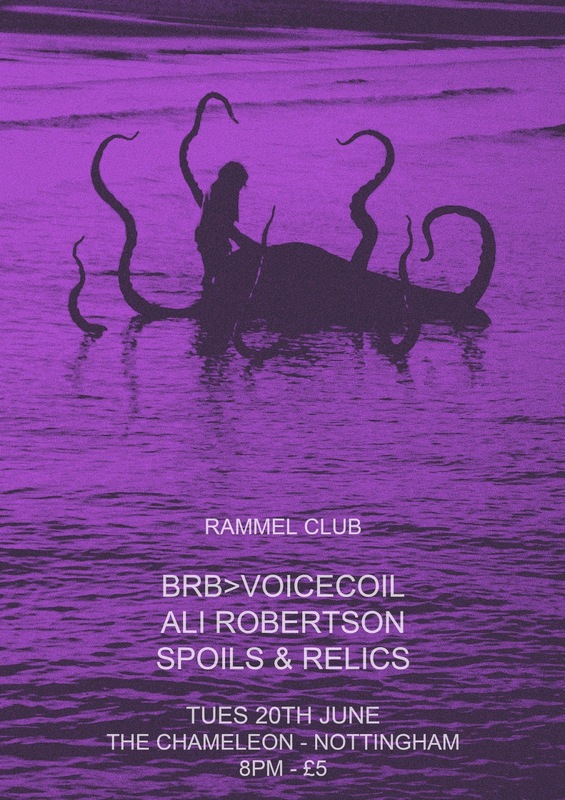 "The Rammel Club... is a deceptively vital outlet for underground music."